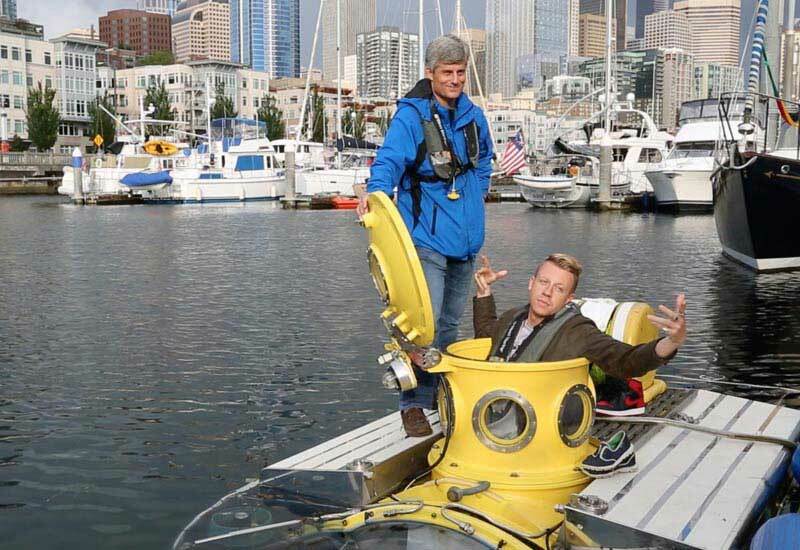 Working in partnership with the OceanGate Foundation and Discovery Channel's Daily Planet, OceanGate successfully launched and dove in Elliott Bay with local rap singer and ocean advocate Ben Haggerty, better known as Macklemore. Our objective was to find the elusive sixgill sharks that roam the deep waters in Puget Sound and fulfill a lifelong dream and ambition of Macklemore, a devoted shark enthusiast. This was more than just another dive in the ocean, it was a unique opportunity to work closely with Discovery Channel's Daily Planet as they documented that entire expedition for a feature presentation on Shark Week that aired August 11, 2014. The dive site is located at a depth of 400 feet and is less than 1/4 mile from shore just off the waterfront in Elliott Bay. This location provided the submersible and her crew a terrific venue to launch from and to maneuver to the dive site in a very short time. To attract sixgill sharks to the dive site, the team sank a bait ball to a depth of over 400 feet two days prior to the dive. Our objective was to position the bait near an existing shipwreck to attract other marine life on this artificial reef. Going deep in Elliott Bay means knowing the local geography and understanding the region’s maritime history. From the late 1800’s till today, Puget Sound has been one of the world’s most active sea ports, creating significant economic opportunity to the region. 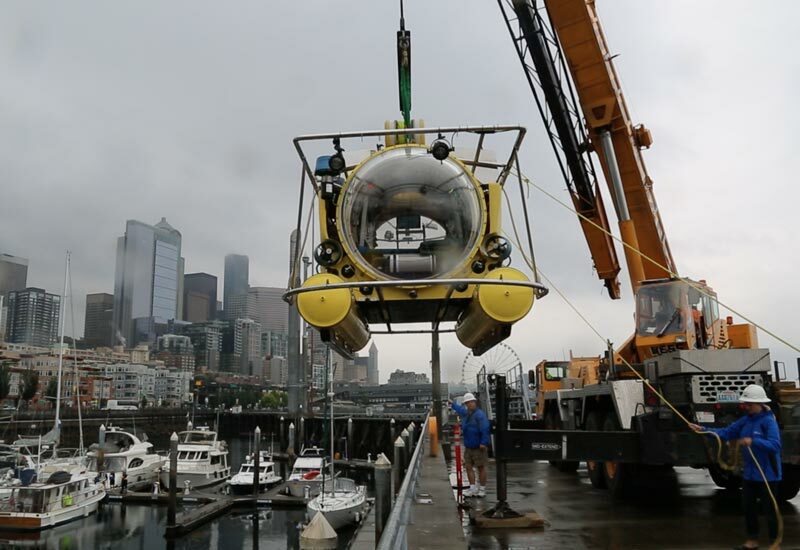 Given our dive site’s proximity to downtown meant operating right in the middle of heavy vessel traffic lanes, including the hourly operations of Washington State Ferries, local cruise companies, and major shipping lines. 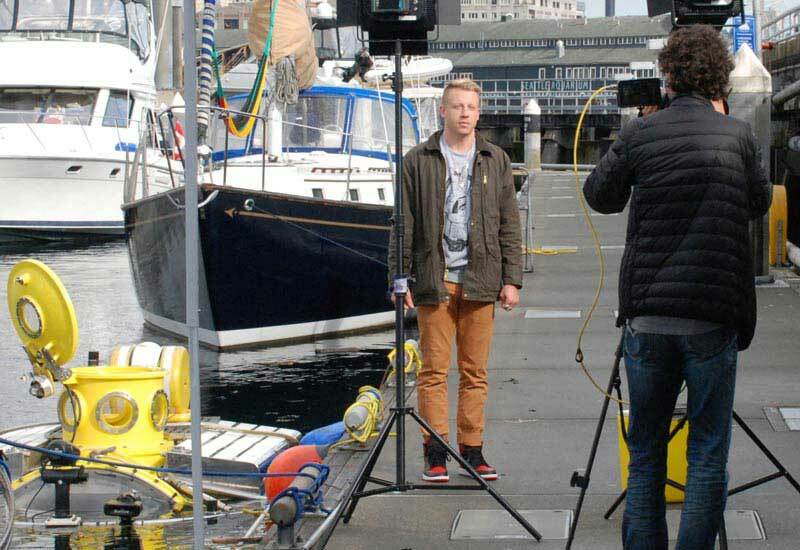 We were greeted by the film/camera crew of Discovery Channel/Daily Planet at 9:15am at Bell Harbor Marina to commence set up and initial filming of the submersible Antipodes, the crew, and shots of Seattle. From there we launched our research vessel and towed Antipodes to her preliminary dive location for inspection and initial test dives before arrival of Macklemore and Dr. Erika Montague, Science and Technology director for OceanGate, Inc. and an expert on marine sea life and shark species. After a successful first-round of dives we returned to Bell Street Harbor and readied the team for arrival of Macklemore and other support staff. The general atmosphere was positive and energetic, despite the rainy weather. Antipodes was outfitted with extra scientific instruments for the mission, including Teledyne Blueview sonar and DeepSea Power LED lights for extra illumination at depth. Fit for all conditions, the five-man submersible features large acrylic viewing domes in both the bow and stern for wide angle of viewing. This makes for a comfortable and highly efficient utilization of space to accommodate all crew members. Late into the evening Dr. Montague spotted something on the sonar the looked like it could be a large object moving a steady rate toward the submersible. Within minutes she noted a tail fin and had indeed spotted a juvenile sixgill shark swimming alone in the dark near our bait tank. The crew and Macklemore were ecstatic! We’d done it! After another hour at sea Antipodes safely returned to the surface and the crew began the careful and patient process of towing Antipodes back to dock. Our missions was nearly complete. Upon return to the dock we gathered to share information about the accomplishments of the day and the success of our night dive in Puget Sound. Macklemore offered some excellent color commentary and perspective on the day. He was delighted to see a shark and OceanGate team were pleased to help make the opportunity become a reality for a passionate advocate of the sea and sharks! Antipodes launch at Bell Street Marina.